esInsights helps in maintaining a lasting relationship with your customers by getting important information towards improving your services and products. With esInsights you no longer have to suspect what your customers want and what are their interests as you can create perfectly targeted campaigns knowing their interests, desires or complaints through access to their feedbacks. Quick and easy process of creating complex although fully customizable surveys that can be sent to specific client segments. Selecting and inviting contacts to participate in the survey is done easily by using a personalized email invitation. 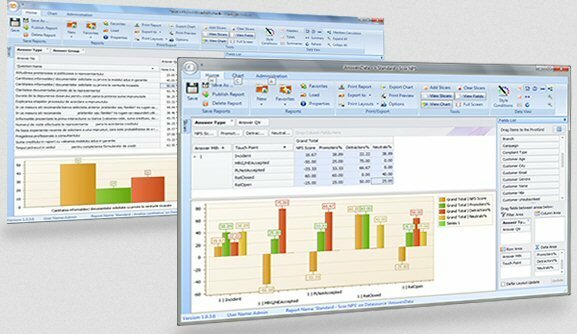 Notice the feedback potential through multiple viewing options: visual charts, tables, pivot tables etc. Configure charts and graphs to create relevant informative reports that aid in shaping opinions and creating action plans through clear customer segmentation. Check campaign feedback in real-time, observe response patterns and transform feedback into improved campaigns, products and services. Fast and complete analysis of free-text responses allows you to act quickly when there are dissatisfied customers and improve the relationship between them and your company. Rental option of software licenses and equipment specialized Data Center (SaaS). ING Bank, JTI, L'Oreal and many more.